As an agent who grew up in Honolulu, Yul brings a wealth of knowledge and expertise about buying and selling real estate on Oahu. Yul was formerly a real estate paralegal at Chang Iwamasa & Chiu, LLP, where she assisted the partners through several lucrative and complex commercial transactions, which cultivated her affinity in real estate. 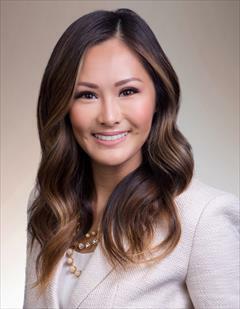 Prior to joining BHGRE Advantage Realty, Yul was at Hawaii's premier commercial real estate company, Alexander & Baldwin, Inc. (NYSE: ALEX), where she drafted leases for A&B's commercial lease portfolio, handled tenant collection matters and assisted in commercial real estate transactions and developments. Yul left her legal profession to pursue a career in residential real estate and to shift her efforts and expertise into servicing clients with their residential real estate needs. She acquired a wealth of knowledge and experience training under BHGRE Advantage Realty owner and CEO, Myron Kiriu (R), shadowing him through numerous transactions and learning the gold standard of the industry so that she may bring exceptional value to her clients. Yul not only specializes in preparing listings for market, but also works with buyers to find the right home at the right price, including all the neighborhood amenities that matter and the essential criteria for their new home. She takes pride in her ability to proactively communicate with her clients, as well as other agents, to ensure a responsive, transparent, and personable service. Yul is committed to servicing her clients and ensuring they are connected with the best real estate opportunities, while maintaining the highest degree of professionalism and integrity, which is imperative to the Better Homes and Gardens' name and brand.